Is that the guy with the "Porsche button" on his wheel for overboost? I can probably find a picture of the car I'm thinking about. On the topic of the 190, things have paused a bit while I figure out what I'm going to do with the bottom end. There are 3 2.3L 190s in Pick-N-Pull yards around here but when looking at row52.com, 1 looks like the engine was already pulled, another is 2 months old (not sure if it's still on the lot), and the third is a 1991. Supposedly MB changed crank journal sizes in '88, but this I hear from the forums and can't find anything about this in my factory service manual PDFs. In the meantime, more cleaning! And searching eBay for brakes. The last time I saw it (which has been a couple years) it was this beast. From a 1991 2.3L 8v motor. The handy thing about 16v motors is the cylinder head and pistons are what make the engine special, the rest of the bottom end is shared with the plain Jane 8v motors. I'm going to bring this over to Autosport tomorrow morning for their blessing, and if everything checks out OK I'll get the correct bearings ordered and get rolling on the project again! In the meantime I've just been keeping the engine covered and lightly coated in WD40 to prevent any rust, so far so good. Having a double-row sprocket for the timing chain is a nice bonus, but the 16v double-row cam sprockets are hard to find (and $$$$) so I'm sticking with the single-row chain for this motor. EDIT: So there's a few other things I should mention after looking at my last post. First, the journal change happened in June '86, so I can use cranks from anything made after that (the '88 thing was bad information). Secondly, one of the local MB gurus on the 'rev got in touch with me and gave me my car's reference/spec sheet, and I'm able to confirm that I'm rebuilding the original engine that was in the car when it was built in November of 1986. So that hunk of metal still had its cross-hatching and factory pistons when I took it apart after 205k+ miles. Pretty amazing. Last edited by ExplosiveToaster; 2014.05.27 at 20:34 PM. You're staying in Seattle? Where do you park/work in two cars? Yep. Since the majority of my friends live here I don't want to move out to the burbs just yet. My landlord is selling the condo I've been renting and I'm putting in an offer on it. It's a nice place that meets my needs for now, the location makes it very easy to get to work, and financially speaking, owning this place shouldn't cost that much more than my rent right now. My plan is to live here for 2-3 years and save up for a real house with a garage, keeping the GTI here with me (secure underground parking FTW) and keeping the rental garage for the 190. I did look into actual houses, but all of the houses in my price range right now are older houses in the far reaches of Seattle (Magnolia, W. Seattle) and they don't make sense unless I work Downtown. Plus if I'm house hunting from a place that I own, I don't have to time my house hunting around a lease. I can't have it all right now, but I can at least take the first steps toward getting there. 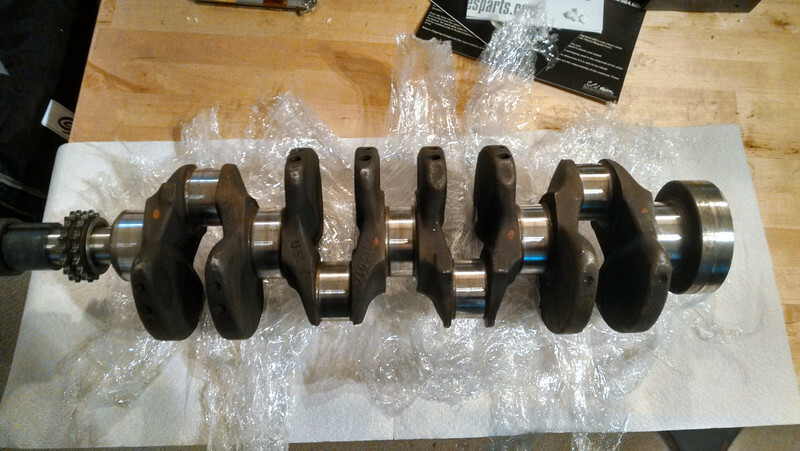 Lil' update: Went to Autosport today -- Terry gave the crank his blessings and Brad hooked me up with a pilot bearing for the replacement crank as well as ordering the necessary main and rod bearings. This crank only needed polishing and is still standard size, so that makes getting these parts way easier than tracking down 1st repair bearings I could be missing something (and probably am, note to self..) but I think all I have left to buy are a few different fasteners, a new oil pickup gasket, and a new timing chain tensioner would probably be a good idea. now to put the engine together? Almost! One more parts order from mbpartsworld. I'm waiting on a spacer ring and cover ring for the part of the crank where the pilot bearing goes (probably not important but good for completeness), and more importantly a new set of stretch bolts for the main bearing caps. Once I get those, THEN I can get back to getting the motor together. One question in the meantime, there's a lot of white residue on the inside of the coolant passages. I can't see any big chunky buildups, just on the surface of the metal. Autosport did tank-clean the block, but "not the traditional hot tank." Any recommendations for something I can put in the block to clean these up? I hear vinegar works well to clean calcium deposits from iron blocks. I've heard that you can even just run a vinegar solution through the cooling system and run the motor for 20-30 minutes, but I figure it might be easier while I have everything out of the car and apart. Last edited by ExplosiveToaster; 2014.06.03 at 20:22 PM. Definitely interested in seeing this running again! Oh schnap! Is there a 700+hp turbo M103 build in your future? Hey man! Glad you joined our forum See joel? the stickers work! It seems this forum is having a run on Mercs. Just having a case of Adams... Where anything he owns is the BESTEST! Happy Saturday all you bastids! Whoa, nice! That one looks pretty clean and mostly stock. Where'd you find it? '87 5spd. That's the good angle, you can't see how bad the paint is on top of the car. Pretty much bone stock minus the euro headlights (which are AMAZING; freakin' laser beams) and the exhaust cut off...which is getting remedied ASAP. Bought it in Chicago and drove it home. Was supposed to have 115k miles on it according to the seller and the odometer, but one night at the hotel I was looking through the service history and it had 210k in 2001... So who knows how many it has now. Runs great though, even the cruise control and AC work. Didn't have a single hiccup on the 2000 mile trip home. I'm likely misinterpreted. When I get a new car, I research the car and learn about it. Me talking about the better points about a car are not meant to be some sort of "my car is best" bragging, as much as it is me sharing what I've learned about a car. Granted there is always an element of me making car decision on what I think is best for my situation, needs, etc. 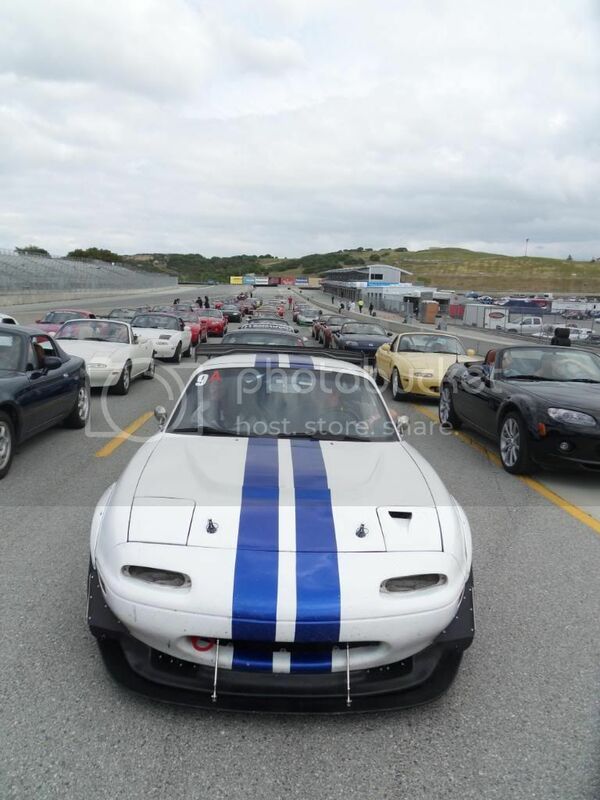 On this forum especially, I talk about why I made those decisions, since this seems to be a more rounded, more mature group of car enthusiasts. Once again, my intention is never meant to stoke my own ego by claiming what I do is any better that what someone else does. I've heard this kind of remark before. So I'm sure there's some relevance to it. I know that most here have experienced my online persona for a decade now. I've also been told numerous times that I'm a lot nicer in person than I am online. I guess something is lost in the digitization. I can't help it, and don't want to change it, but cars get me excited. I tend to get very enthusiastic about a new car. I blather on and on about them, take tons of pictures. It's what I do. Very exciting! That must have been a great road trip! If properly taken care of, that car should live longer than you. Was supposed to have 115k miles on it according to the seller and the odometer, but one night at the hotel I was looking through the service history and it had 210k in 2001... So who knows how many it has now. Runs great though, even the cruise control and AC work. Didn't have a single hiccup on the 2000 mile trip home. sounds like mine. Probably wouldn't hurt to give the CIS and ignition system a looking-over. Sounds like yours had a good life so far so the motor is probably in really good shape on the inside regardless of the 210k+ miles. Does it still have SLS in the rear? Ordered my main bearing bolts today. I did buy a set but I accidentally ordered the old style (M12x70) non-stretch bolts instead of the new stretch bolts (M11x62), because mbpartsworld's catalog doesn't specify. 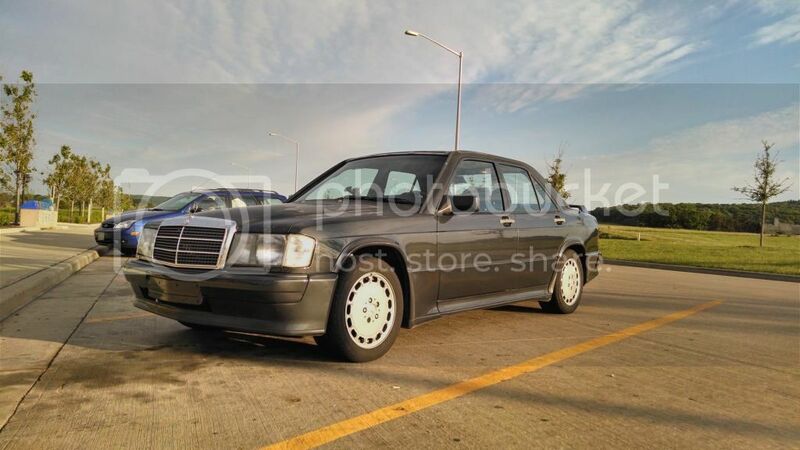 Fortunately the dealer EPC does, so Barrier MB in Bellevue (down the street from work) put in the order today and they should arrive from Germany sometime next week. FINALLY I should be able to get the motor back together! Not yet They said "about a week from now" so I'm assuming that means they'll get in tomorrow...when I'll be working from home in Seattle. Guess there's always Saturday.